It was two years – two long years – following Philadelphia drafting forward Dario Saric before he represented anything tangible for them as a basketball player. The very GM who obtained him through a draft-night trade with the Orlando Magic (Sam Hinkie) did not last long enough to oversee his first game in a Sixers uniform, or even the execution of his rookie NBA contract. 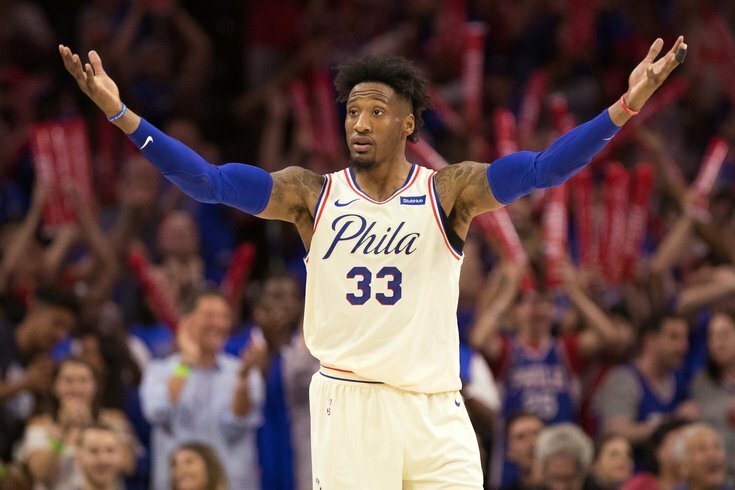 The wait may not have been as long for Robert Covington — he jumped right into the fray in 2014, after all — but his journey as a player has probably had more twists and turns than his Croatian counterpart. Brought in originally to shoot threes at a high volume with anything else a bonus, Covington has transformed himself into one of the league's best perimeter defenders, a switchable, relentless athlete who has been instrumental in the genesis of Philadelphia's elite defense. They are very different players who took very different paths to reach the point we're at today. But they will be connected for as long as they are in Philadelphia together, because their success within the framework of Philadelphia's Game 1 victory over Miami is a reminder of why the Sixers are here with this opportunity in the first place. "He was huge, had a lot of deflections, blocks. He's just a great defender all around," said Ben Simmons of Robert Covington after the game. "He did a great job tonight." Their head coach was a little more effusive in his praise for the wing player, and launched an extended speech about the relationship between the coach and player who have been grinding together the longest. I thought he was unbelievable. I thought he was a man. Physically sliding his feet, blocking shots, hands on balls, he's deceptively strong, and he's so versatile a defensive player. He can sit down and guard Dragic, or go over and he may get caught on Olynyk and he can guard that too. He's such a wonderful story for us, because he is a poster child in regards to development. Just trying to find somebody, develop them, give them a chance, went through those rough years, [and] only Joel [Embiid] has been with me longer. And that's by not much. He was fantastic. Just as much as Embiid does on the backline, Covington takes great personal pride in being a tone-setter on the defensive end. It seems odd to call him a senior figure within the team, but that's exactly what he is. His teammates, JJ Redick among them after Saturday's win, relay that when the Sixers need one big stop, one big quarter, one big run to either ice a game or flip the script, it's Covington who is typically one of the men in the huddle getting the message across. Even if he never said another word on the sideline, Covington's actions and communications on the court put him on a lofty defensive perch. He directs traffic in transition, and when all else fails, it is Covington who steps up and takes the ballhandler, often succeeding in getting a stop. Just as he did during the regular season, Covington took on the challenge of guarding Miami's All-Star in name only point guard Goran Dragic, and he absolutely shut him down. Dragic was 0/4 with a turnover and zero assists in the 22 possessions Covington guarded him on, effectively erased from the game. Covington's secret is not that he never gets beat or that he's immune from mental mistakes, but that his compete level never drops and he moves on to the next play no matter what happened on the previous possession. "It's hard to describe Cov," JJ Redick told Philly Voice at shootaround before Saturday's game. "There's almost like a mental block where it's always, next play, next play, next play. I think in the playoffs especially, you're going to have a lot of stuff that goes wrong, things get amplified in the playoffs. You have to be able to move on to the next play." If that's frustrating for you to watch when Covington is in the middle of an 0/7 night from three, learn to appreciate it on the defensive end. He suffocates opposing guards, clogging their airspace and using his superior length to keep them at bay. But he's also long enough and quick enough to recover if someone gets a step on him, and he came up with some highlight reel blocks against Miami on Saturday. When you ask Covington about the secret to his and the team's defensive success, whether from a broader perspective or on a game-by-game basis, he's usually not one to divulge a lot of secrets. He's happy to speak at length about the crowd or his teammates, but he speaks with a level of caution about the defense's secret sauce. "We came in and watched how they were scoring easy, and then we made a few adjustments," Covington told Philly Voice after the win. "It started with me telling everybody, look, we got to finish up, finish plays, they can't get nothing easy. Guys just bought in, you [saw] it from the third quarter on. It was a different level." What a lot of people see is the block at the end of this third quarter play against Miami, which is definitely a showcase of Covington's recovery speed and length. What gets a little lost is the beginning of the possession, which might be a better indicator of why Covington's on/off numbers are so stark this year. Covington cheats just enough into the paint to disrupt Tyler Johnson's drive, and never far enough away from Dragic that he's a threat to shoot. Certain shots never materialize because of this battle for a few extra inches that Covington wins routinely. To have this sort of performance in his first-ever playoff appearance felt like validation for years worth of undue criticism. Covington can be a frustrating player to watch sometimes, sure, but with more offensive weaponry on the court, he has been freed to focus on the things he does best. Without the development time he got during the lean years of the rebuild, who knows if he ever becomes the player he is today. In any case, the guy who was accused of being a "patsy" brought in to help the Sixers lose is one of the chief architects of Philadelphia's culture. The Saric timeline is much different, but no less integral to Philadelphia's success. More immediately helpful options were available on draft night in 2014, including a favorite of local talk radio callers, Doug McDermott. After the Sixers selected an injured Joel Embiid at No. 3 overall, doubling down on a European player who wouldn't come over right away just added fuel to the fire. For those of your familiar with the infamous experiment, Saric's story is basically a practical spin-off of the marshmallow test. Just as it is obviously better to wait and receive two marshmallows instead of settling for the immediate gratification of one, it is better to have to wait for a good player to arrive than it is to settle for a lesser one just to have one. Saric continued a season-long demolition of the Heat on Saturday night, scoring 20 points on 8/15 shooting while adding six rebounds and three assists in the process. We spotlighted his regular season contributions against the Heat in our overarching playoff preview, and I speculated that Saric's season shooting numbers might prompt the Heat to switch up their defensive coverage against him. That was a big fat "Nope." Miami's insistence on dropping back toward the paint continued on Saturday, with the Heat doing their best to wall off Ben Simmons and Co. from attacking the basket. With space he needed to let shots fly, Saric did what he has done for the majority of the 2017-18 season: he made the opponent pay for not showing him proper respect from distance. Any day now teams are going to start acknowledging that Saric shot over 39 percent from three this season on 5+ attempts per game. Until then, the Sixers feel quite comfortable getting him the ball out there over and over again, because they don't have to run complicated action to get him the ball. The lack of attention he gets in transition compared to, say, JJ Redick or Marco Belinelli has Saric walking into a lot of his shot attempts. He has made the above-the-break three his baby this season, attempting 40 percent of all his shots from that spot on the floor. What makes Saric even more dangerous is the combination of that shooting with his ability to see over the defense and hit guys on a rope with passes. Similar to Simmons, the problem with giving him any space on the perimeter is you're only clearing his vision to make hitting cutters easier. I'm not exactly going out on a limb here, but I'm pretty sure this guy was worth the wait. What Saric and Covington bring to the table, though, goes so far beyond three-point numbers, blocks, or a penchant for flashy passing. One of the steadfast suggestions from opponents of Philadelphia's rebuild was a supposed toxicity created by the on-court results. The truth is a lot more complicated than that, and building a culture is much more complicated than that. Philadelphia has played hard for the entirety of the Brett Brown era, talented or not, and Covington's rise from D-League gunner to key cog of the team is the epitome of what a long, measured rebuild is about. You are not going to hit on every pick or free agent, you are not going to be able to predict how people react to success or adversity, and you can't say who will step up or shrink from the big moments. But you can build an understanding of someone's basketball character — and thus, a confidence level in who they might become — if you pay enough attention every night. No one's basketball character shines through more often than Saric's. A play is never dead with Saric on the floor. During one particularly scrappy sequence on Saturday night, Saric combined with Amir Johnson to create two jump balls in a row, and when the ball bounced his way following a hectic sequence, he absorbed contact and finished at the rim, drawing loud cheers in the process. That guy is a winner, as both a player and a person. And the latter part is important, because from the head coach right on down, the Sixers have assembled a group of people over the years that care deeply about basketball. Having one player like that is a start, having two players like that is an uprising, and before you know it, there is a snowball effect that turns your group into a capital-t Team. "The progressive growth of belief," Brown called it after the game. "It is easier to cultivate that when you’re winning. Now I think we are 26-1 at home since Christmas, we’ve won a lot of games in a row, it sort of all adds up." The decisions and additions in the years since have played no small part in making that possible. But in their search for superstars five years ago, the Sixers ended up discovering players and people who could set the tone without being in a primary role. If you put enough good people in a room together, things tend to fall into place. That's exactly what having men like Covington and Saric on the floor – and in the locker room – has done for the Sixers.